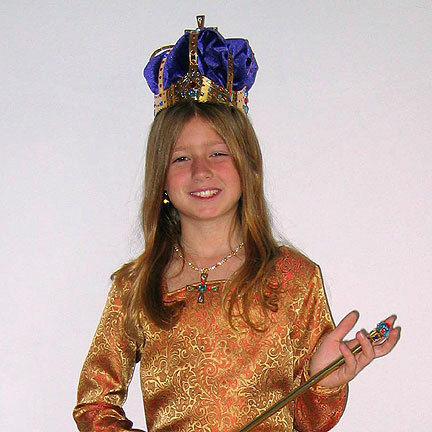 For Halloween 2007, I created a Queen Elizabeth I costume for my youngest daughter that featured richly embroidered fabric gown with a dropped waist and long sleeves. An ornate crown, scepter and necklace complete the look. The richly appointed Queen Elizabeth I Costume has golden floral gown or dress, coronation crown and jewel-encrusted scepter. To create the lines of this coronation dress, I had to use two different patterns – one for the square neck (Butterick 4884), the other (Simplicity 5835) for the pointed dropped waist. We added velvet trim to the wrists and a rhinestone encrusted metallic trim to the waist. Even though the cape in the portrait was long and full, I chose practicality over authenticity in this instance and made a short cape with side slits. The side slits allow my daughter to have her hands free for her scepter and her trick-or-treat bag, which in this case is a gold “designer” handbag. 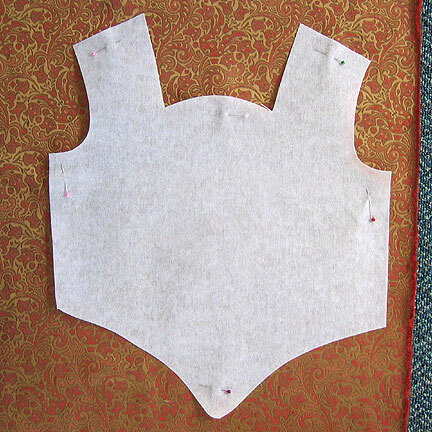 I used heavyweight interfacing for the front of the bodice to give it the stiff, crisp look of the original. 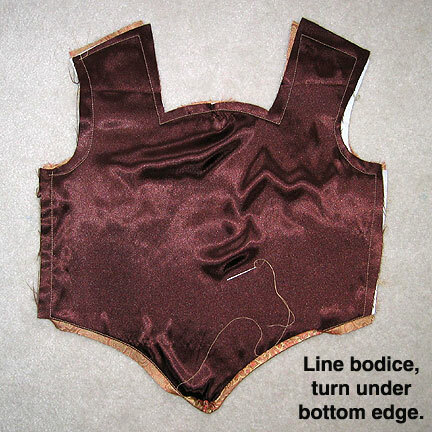 I lined the bodice with brown silk so the rough interfacing wouldn’t rub against the skin. Folded the skirt fabric to resemble the pleats shown in Queen Elizabeth I portrait. Rather than gather the skirt before sewing into the bodice, I folded the fabric to resemble the pleating in the portrait. 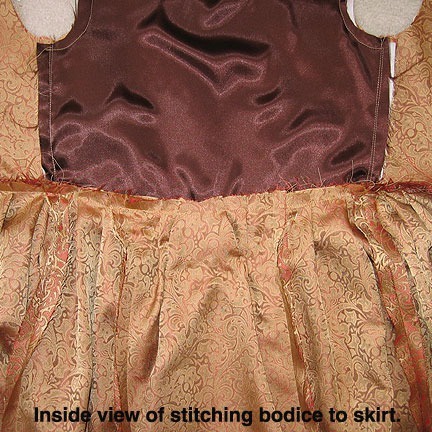 I stitch the bodice to the skirt along normal sewing lines just until the side seams. Then I overlaid the bodice on front of skirt and basted it in place from side seams to center point. For hip bustles, I stuffed very small pockets that were about 3″ x 6″ and stitched them into the side seams at the waist. I designed and etched a flat sheet of metal to create the parts for crown. I then bent and folded the parts to assemble it. First, I curved the base into a circle and rivet it, then I gently shaped the bands curving down onto the base and riveted them together. I covered the rivets and the rest of the crown with large Swavorski rhinestones. This step took about 8 hours of carefully placing the correct size and color rhinestone into each slightly recessed location. We found some pretty lace-covered shoes to finish out the look. She chose to wear gold spiral earrings with gorgeous dichroic glass center stones by jewelry artist Katya. 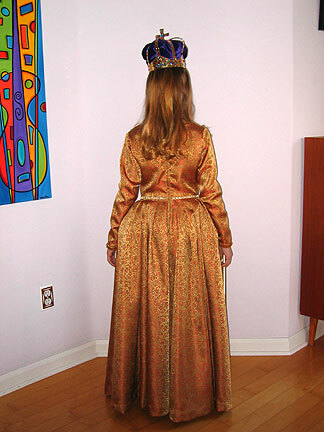 Back view shows waist detailing on Halloween costume of Queen Elizabeth I gown. Used gold “designer” handbag as a trick-or-treat bag. Might as well make your handbag match your outfit! Besides, an orange pumpkin goes with so little. 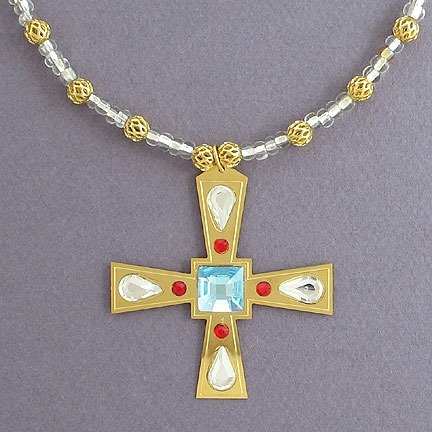 I designed and etched an ornate jewel-covered cross necklace with Swarovski crystals to continue the regal theme. The large cross necklace matches the cross on top of the crown. In addition, I made a scepter out of a brass curtain rod and glued additional rhinestones onto the top and bottom of it using E6000 glue. Medusa Halloween costume gown was made from beautiful snake-colored olive green silk shantung and lined with a chestnut brown silk satin. 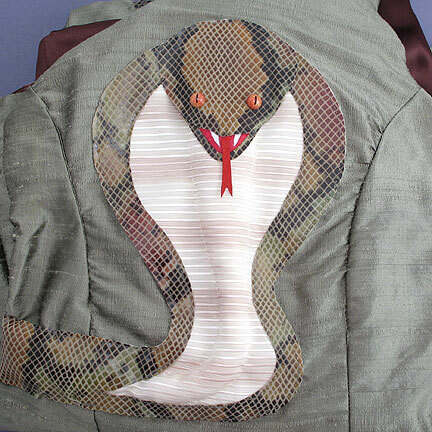 Used Butterick pattern 4343 then appliqued it with with 3-dimensional King Cobra. Read below to learn how I created this custom Halloween costume. 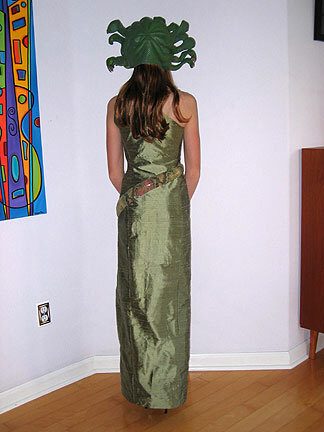 I created this Medusa costume for my eldest daughter for Halloween 2007. 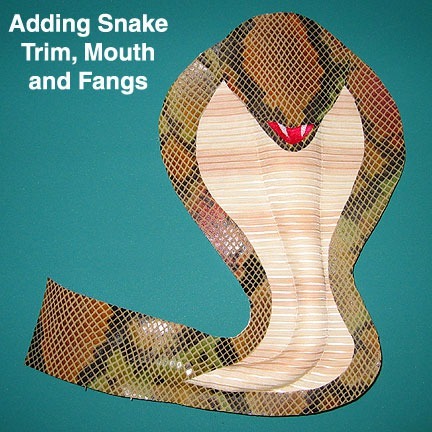 It has a King Cobra appliqued on the front, and I made snake jewelry accessories as well. 3-D King cobra wraps around girl’s dress at waist. 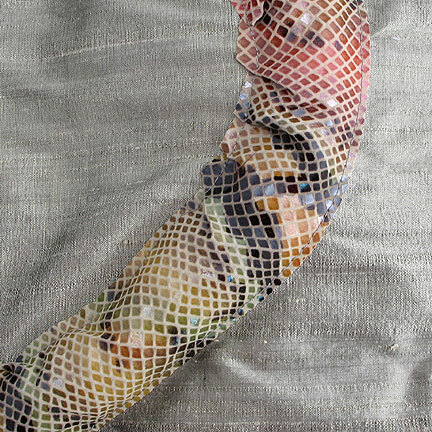 Used snakeskin fabric over rope batting to create the three dimensional look of a real snake. All the other kids wanted to poke the snake! To create the King Cobra Hood I started with an ivory ribbed fabric used that looks vaguely like the articulated body of a snake. I selected an ivory ribbed fabric that would give the vague impression of the articulated body of a snake. To dye the fabric with stripes, we settled on a mix of pomegranate juice and strong tea after testing coffee, vanilla and otherfruit juices. 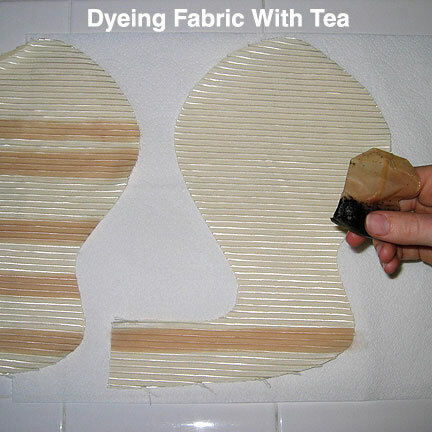 The tea bag itself worked well as a paint brush.After brushing on the dye, iron the fabric to set the color, rinse out and iron the fabric again..
Once dry, place the ivory fabric over a piece of heavy interfacing cut in the same shape. Tucked in two piece of 1/4″ braid to lift the fabric to make room for fluffy polyester fiberfill. Traced the dashed sewing lines on a piece of tissue and lay that over the top of the ivory fabric. Stitch along sewing lines, then pull out braid. Lay border trim of snake plus snake head over ivory fabric and stitch along edges leaving clear end openings of area to be stuffed. Lastly stuff with fiberfill. 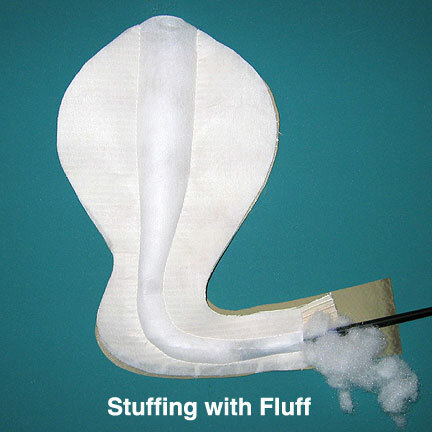 Sewing the Cobra: Place ivory fabric over piece of heavy interfacing cut in the same shape with two pieces of 1/4″ braid in between to create space for fluffy polyester fiberfill. Stitch along sewing lines, then pull out braid. Using a chopstick, push fiberfill into snake body until tight and compacted. Layer underbelly fabric on snakeskin. Use fusible adhesive to attach. Overlay with head, mouth and fangs. Stitch on snake eyes and forked tongue. Stitch or fuse in place. Lay King Cobra head and upper body piece on dress and stitch along outside edges. Cut a long strip of snake fabric and pin around dress, having the top end meet the upper body piece at the side seam of dress. Sew top edge of snake body around dress. Next, begin stitching opposite edge and filling with cording and fiberfill as you go along. 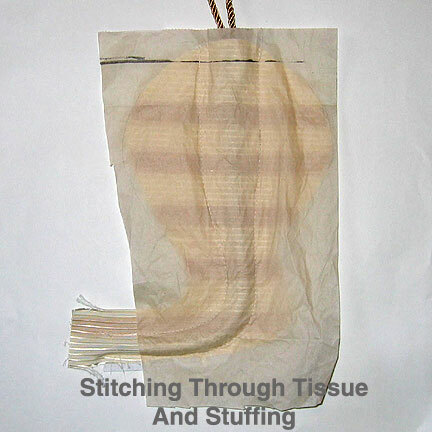 Fabric needs to be in the stuffed position before stitching, otherwise the dress fabric will be pulled out of shape. 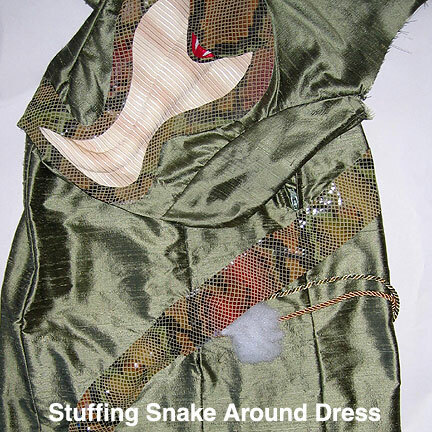 Tuck or fold snake body around curves, and cut extra curves in snake fabric near end of tail. 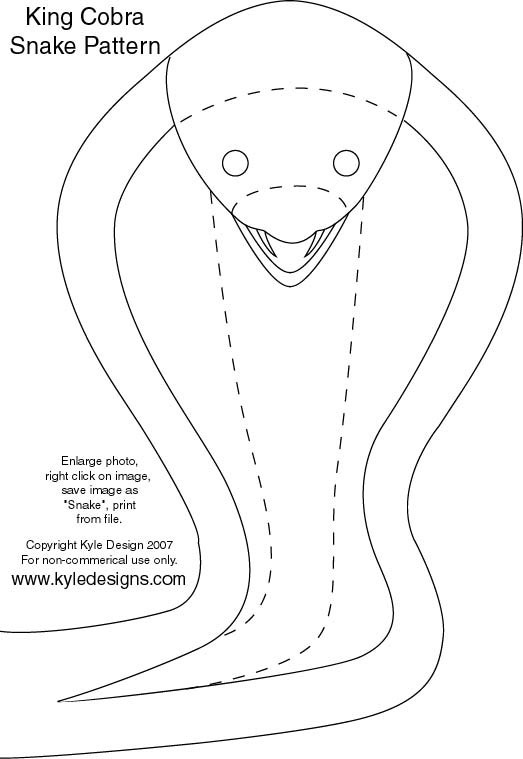 Enlarge and print this pattern to make all the parts for a 3-dimensional snake on the front of the Medusa costume. Lay King Cobra head and upper body piece on dress and stitch snake around dress along upper edge. Stuff. Stitch bottom edge. Here’s a close-up view of the cobra body applique which was surprisingly life-like. Flexed and moved with the body causing everyone to do a double-take. I added snake eyes purchased from Van Dyke’s Taxidermy in SD using E6000 glue. I cut a tiny forked tongue out of red Ultrasuede and stitched that onto the mouth. We added the snake jewelry I made and set the Medusa headdress on top.Like my snake earrings? See Unique Serpent Snake Earrings to purchase a pair of your own. Shop for Unique Snake Gifts and Decor. 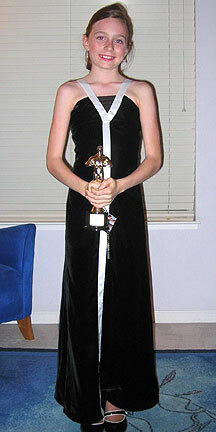 For Halloween 2006 I created a girl’s costume for Julia Roberts wearing Valentino. 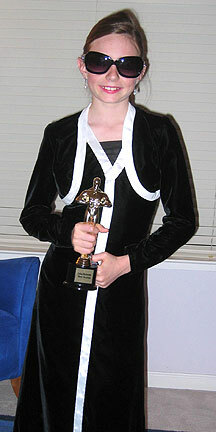 This was the famous black and white designer dress Julia Roberts wore when she received the 2001 Oscar Award for Best Performance by an Actress for her portrayal of Erin Brockovich (2000). Movie Award Themed Gifts and Decor. White ribbon stripes going up back become shoulder straps. 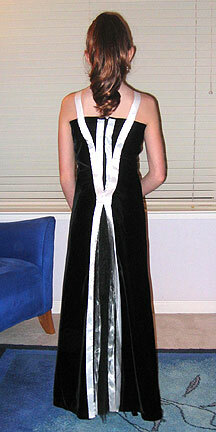 Back slit edged with white satin ribbon. Several yards of black netting gathered under the back of the slit to create fullness. This shows the side view of Julie Robert Valentino dress with the netting in back. I made my daughter’s costume out of velveteen, netting and satin ribbon. I started with Butterick pattern 3484 which is a long dress with an Empire waist and a slit down the front. I altered the pattern pieces so the slit was in the back of my version. I edged the slit with white satin ribbon and added several yards of netting gathered under the back of the slit. To create the “V” of shear fabric in the front, I sewed on a “V” of the shear with two rows of stitching, then cut away the velveteen underneath. I then trimmed the edges with the white satin that became the straps of the dress as well. To finish out the look, we added a long matching hair piece plus black and white high-heeled shoes. In addition, I purchased a small Oscar-like statuetteonline from K-2 Awards that we had engraved with Julia Roberts – Best Actress. And of course, no movie star look would be complete without large dark sunglasses.I sewed a short Bolero jacket to match using McCall’s Fashion Accessories pattern M5197 to keep her warm while she was out Trick-or-Treating. 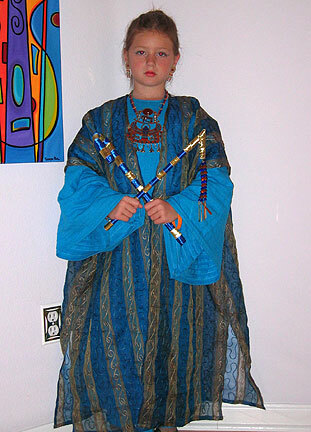 For Halloween 2005, I made an Egyptian Costume of King Tut, including the golden jewelry plus a crook and flail. Kyle’s gold reproduction King Tut necklace and earrings based on the original photos of jewelry from King Tut’s tomb. 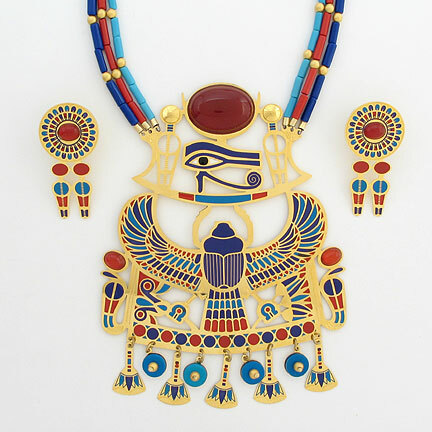 Embellished with carnelian gemstones, aluminum discs, plus beads of turquoise, coral and lapis colored tubes. Private collection. 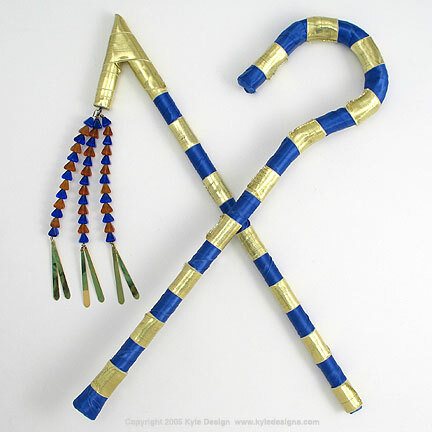 DIY King Tut costume royal Crook and Flail. Use wood or Plexiglas rods and forms then cover with gold and blue ribbon. Prefer just to buy an Egyptian crook and flail Kyle’s made? You’re in luck! Just click on King Tut Egyptian Costume Crook and Flail for Sale. Gold scarab bracelet based on photo from King Tut’s tomb. 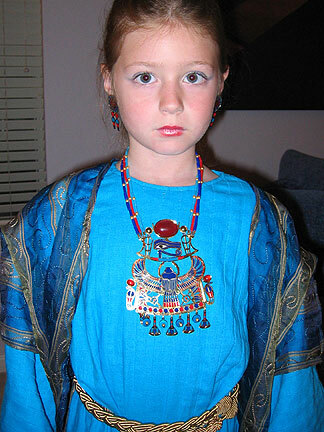 The gold necklace is striking against the turquoise blue fabric of the the Egyptian dress costume. This weekend is the 18th annual Livermore Wine Country Festival right in beautiful historic downtown Livermore, CA. If you haven’t been to Livermore lately, this is a great opportunity to visit the Livermore Valley Wine Country, do some wine tasting and enjoy the atmosphere. Festival hours are 10-6 on Saturday and 10-5 on Sunday and there will be a lot to see and do for both adults and kids. I’m taking my girls and I’m on my way! A Beer Handbag Holder is a must if you are visiting tasting rooms - keeps your purse where you won't forget it. The festival is being held on First Street between P and Maple, and on Second Street between N and K Streets. The Sunday morning Farmers’ Market will be going on at the same time on Second Street from 9:00 a.m. to 1:00 p.m., so you can even get in some healthy food shopping while you’re at it. There will be about 250 arts and crafts vendors, 3 wine tasting stations and locally brewed beer. There are five sponsoring wineries who will be featured at the Premier Wine Pavilion at the Livermore Valley Plaza in front of the Bankhead Theater (First and McLeod Streets): Big White House Winery, Garré Winery, Page Mill Winery, Mitchell Katz Winery, John Christopher Cellars. Local breweries sponsoring this festival include Lagunitas Brewing Company and Schooner’s Brewery. For the kids there will be games, rides, activities and water fun. There is also a great toy store on J Street called Whoopsiedaisy Toy Shop that always has creative, unusual toys (and they encourage your kids to play with them!). Older kids can check out the 6TwentyOne Skate Shop. Many people in the S.F. Bay Area are familiar with downtown Livermore from their very popular Downtown Halloween Night when the local businesses hand out candy to all comers. Livermore has completely redone their downtown with wine streets, trellises, fountains. We have the stunning new performing arts center, movie theater, restaurants and businesses. Livermore is really a nice little town to visit, and if you do like touring wineries and checking out wine tasting rooms, there are more than 40 local wineries right here. So you can really make a day of it when you visit! Kyle Design of Livermore also has many beautiful wine, beer and arts themed gifts. 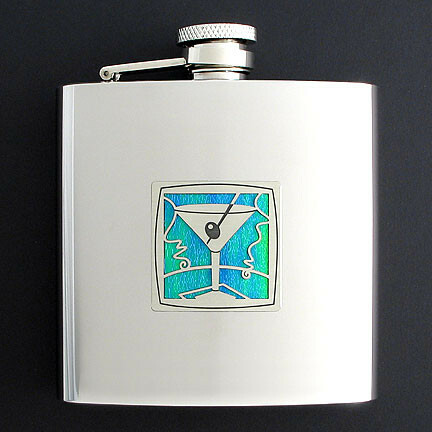 If you’s like to see more of Kyle’s unique items, visit her web site for Kyle Design’s Wine Gifts, Kyle Design’s Beer Gifts, Kyle Design’s Arts Gifts. You’ll find business card holders, flasks, purse hooks, and so much more with artistic, original designs by local Livermore artist Kyle McKeown Mansfield. 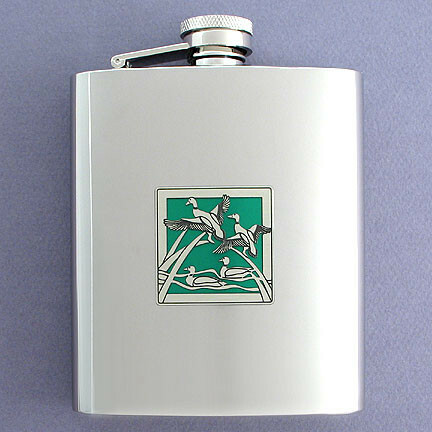 Artist Drinking Flask - A stylish way to hold your liquor, wine and beer on a cool afternoon. My youngest daughter requested a Queen Elizabeth I Halloween costume this year so I made her a gold brocade coronation gown and a jewel-encrusted golden crown. We saw Elizabeth the movie earlier this year and listened to books on tape about the queen’s early years as well, so this was my daughter’s concept for months. For inspiration, we used still shots from the movie as well as the one portrait of Queen Elizabeth I that seems to be available. Working with what we could find, I was able to make a gown, cape, crown and scepter that definitely invoke the feeling of the image. Note that the actual crown no longer exists because it was melted down in the mid 1600s. Coronation Gown: We found a beautiful golden brocade fabric at Britex in San Francisco which had a flower pattern – we were hoping for roses, the Tudor symbol, and maybe these are rosebuds on the fabric. I used two different patterns, Butterick 4887 and Simplicity 5835, and modified them to fit the shape of this gown with its long pointed bodice and pleated folds over hip bustles. 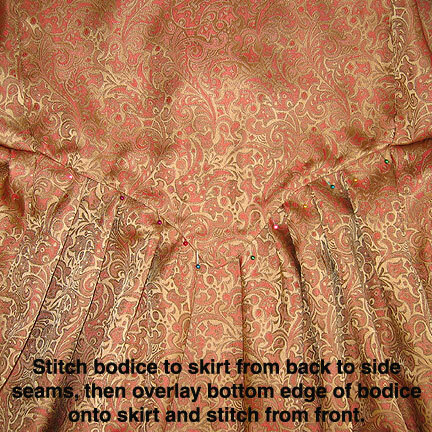 If you’d like to see larger photos, other views or read tips and tricks on how I altered the patterns, please click Queen Elizabeth I Costume and Crown. Coronation Crown Jewels: I made an etched gold crown with the eight bands of metal and a large cross at the top. I embellished the crown with ruby, diamond, sapphire and aquamarine colored Swarovski crystals which took me 6 hours to glue on. >:-( I couldn’t find crystals as large as those in the photo, so I had to wing it a bit and do what was possible. I needed large flat back rhinestones and found the best selection of sizes, colors and new shapes at Dreamtime Creations. I was really pleased with the prices and service, too. I couldn’t actually tell whether there was fabric in the middle of the crown or not either, so we decided on purple velvet because purple was the color of royalty. 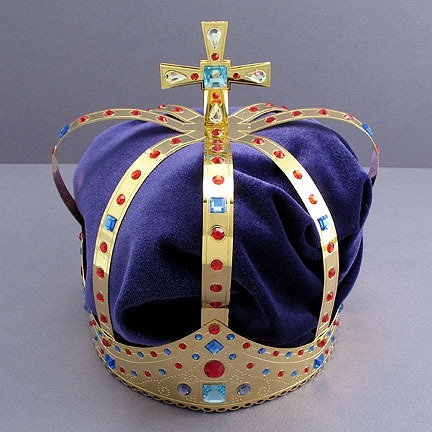 Some more modern day crowns are made with red velvet, some with purple, but because the photo was so dark, we assumed that if there was fabric it was most likely purple. The deep color also allows the gold and jewels to pop against it. Scepter: I made the scepter, or sceptre as the English spell it, out of a 18″ expandable brass curtain rod and glued the rhinestones around the top and base of it using E6000 glue. The scepter is the symbol of royal authority. 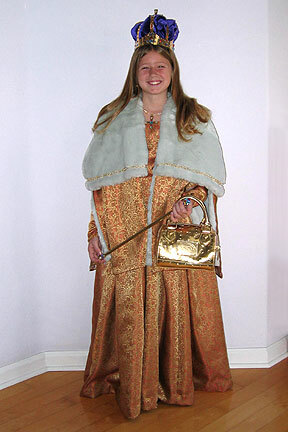 Fur Cape: Rather than adhere to authenticity, I chose practicality when it came to making the cape. The cape in the portrait is huge – long, full and fur-lined inside as well as along the outside collar and one can only imagine how heavy it was. I chose instead to make a shorter cape with slits at the side so my daughter could still use hers hands while wearing it. I had been intending to make fake ermine, and had tested simply taking a black marker to the white short-haired fur that we found which looked pretty good, but just ran out of time before our first event, Livermore’s Downtown Halloween Night, which is always the Thursday before Halloween each year. For this event, all the stores along the main streets in downtown Livermore hand out candy to all the children. It is a very well attended event and it is fun to see so many fabulous costumes. The kids are so cute!! 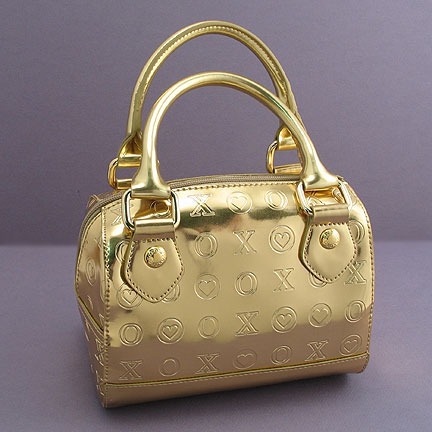 Accessories: Instead of a tacky plastic pumpkin in which to collect her candy while trick-or-treating, my daughter instead selected a metallic gold handbag. It has already received many compliments at parties and events! Might as well make your handbag match your costume – those finishing touches really make a difference. She add lace pumps and gold earrings that another artist friend, Katya, made to complete her look. 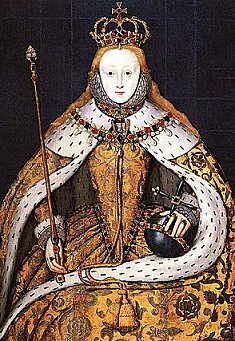 Who was Queen Elizabeth I? She was the daughter of Henry VIII and Anne Boleyn, and she was known as the Virgin Queen of England because she never married. She was born in 1533, and reined from 1558 until her death in 1603 at the age of 69. Movies: The first Elizabeth movie came out in 1998. The new Queen Elizabeth I movie Elizabeth: The Golden Age came out just this month and we plan to see it now that the costume is finished. It stars Cate Blanchett, Clive Owens as Sir Walter Raleigh, and Geoffrey Rush as Sir Francis Walsingham. If you’d like to see my current collection of queen, king, princess or prince gifts such as the Queen’s Crown Ornament or Princess Flask above, please visit my Crown Gifts page. Please visit my Handbag Gifts for more gift ideas with purses. 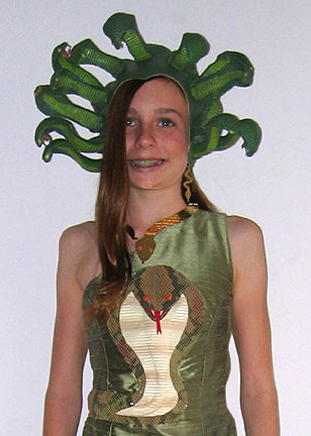 I love sewing unique Halloween costumes for my girls and this year, I’ve made a Medusa costume that has a 3-dimensional King Cobra appliquéd on the front which wraps around the dress. 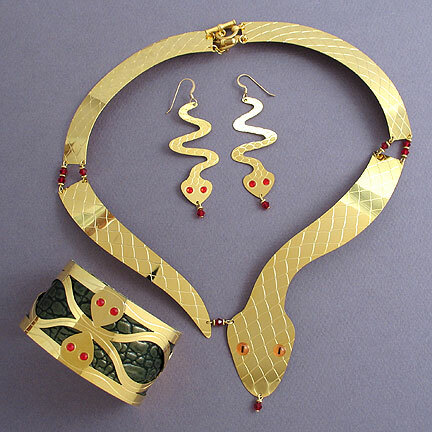 I created the snake accessories as well, including the etched metal snake earrings, snake necklace and the snake armband. In an exception to my usual preference of making everything, I bought the Medusa snake headpiece from Bonnie’s Treasures – it’s perfect, and I’m glad I didn’t have to attempt to create snake hair. Dress: For the dress, we started with olive green silk shantung and lined it in chestnut brown silk satin. We chose Butterick Fast & Easy pattern B4343 which is a close-fitting, off the shoulder gown with a high slit. We found gorgeous fabrics at Britex Fabrics in San Francisco in different textures and colors that worked perfectly for this Halloween costume. I used a ribbed ivory fabric for the snake underbelly and a very fine snake printed knit for the snake body. I dyed faint stripes in the ivory fabric using tea and pomegranate juice. (For full instructions with photos, click Medusa Costume Sewing Tips.) For the snake face, I used red satin and white satin that I fused together to make the open mouth and fangs, a small piece of red Ultrasuede for the forked tongue, and snake eyes that I purchased from Van Dyke’s Taxidermy. I made a short bolero jacket out of a shimmery green crimped knit using McCall’s Fashion Accessories pattern M5197. Jewelry and Accessories: We found the perfect shoes at Target: snake print pumps by Isaac Mizrahi. I created the earrings, necklace and armband in polished gold etched brass with a snake skin pattern and embellished them with Swarovski crystals that I purchased from Dreamtime Creations. (I did a fair amount of searching and found Dreamtime Creations’ selection of shapes, size and colors to be the best, plus the prices and package quantities were great.) I created a few extra pairs of the golden Snake Earrings which are available for sale by clicking the link. If you’d like to see larger photos, detail shots or want to print out the pattern piece I created for the King Cobra appliqué, please visit Medusa Costume Instructions. How did Medusa die? She was finally beheaded in her sleep by Perseus who used a mirrored shield to help him direct the fatal blow. From her neck sprang Pegasus (the winged horse) and the giant Chrysaor. Perseus eventually gave the Medusa’s head to Athena who placed it on her shield, the Aegis. If you’d like to see more of my snake gifts and jewelry like the Snake Night Light or the Snake Badge Holder above, please visit my Snake Gifts and Home Decorations page. Weird Halloween Decorations – Iris Bulb Monsters – I Warned You…. OK, these Halloween decorations are weird, but I think that’s part of the fun of the Halloween holiday. Besides, I’m an artist and when odd things strike me, I go with them. We set them out by the front door and it was so much fun watching people’s reactions. They’d stop, stare at them, then finally ask in a creeped-out tone of voice, “What … ARE … those?? ?” Because the roots of the bulbs were long and twisted, it gave the look of legs and tentacles, so people weren’t sure if they were some sort of sea creatures still in their shells, or shrunken animals (as if we used the same process as creating shrunken heads), or potatoes gone wrong. I think they realized (eventually – you could see their brains processing all the information) that they couldn’t be too disgusting to touch because they were decorated with googly-eyes, sparkly pipe cleaners and colored toothpicks, and because of the grins on my girls’ faces. If you are not familiar with growing irises, you probably never have seen anything quite like these. If you’d like larger photos to see the details, click on Weird Halloween Monsters. 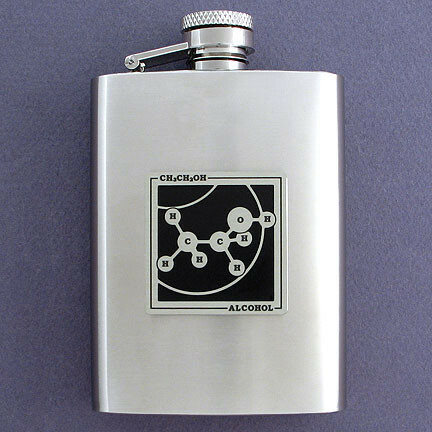 If you’re going to a Halloween party and want to bring a fun host or hostess gift, or just have a laugh when you pull out an Seeing Double Aliens Flask (Have I had too much too drink? I’m seeing double! Aliens! ), be sure to check out my Fun Halloween Decor and Gifts page. You’ll find unique, creative, yet more traditional, Halloween decorations and gifts such as Bat Ornaments, Alien Flasks or Mouse compact mirrors. Or visit our Bat Gifts, Mouse Gifts, or Alien Gifts pages if those are your favorites. Last year, my 10-year-old daughter’s request for her Halloween costume was to be Julia Roberts wearing Valentino. This was the black and white designer dress she wore when she received the 2001 Oscar for Best Actress for her performance in Erin Brockovich (2000). Julia Roberts is holding her Oscar Statuette after receiving her Academy Award in the photo at right. I made my daughter’s costume out of velveteen, netting and satin ribbon. My daughter loved the costume and was thrilled when people actually recognized who she was. I started with Butterick pattern 3484 which is a long dress with an Empire waist and a slit down the front. I altered the pattern pieces so the slit was in the back of my version. I edged the slit with white satin ribbon and added several yards of netting gathered under the back of the slit. To create the “V” of shear fabric in the front, I sewed on a “V” of the shear with two rows of stitching, then cut away the velveteen underneath. I then trimmed the edges with the white satin that became the straps of the dress as well. To finish out the look, we added a matching hair piece and black and white high-heeled shoes. 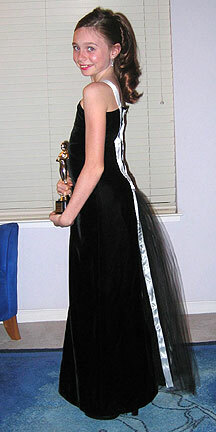 In addition, I purchased a small Oscar-like statuette that we had engraved with Julia Roberts – Best Actress. These small award statues are quite affordable and can be purchased from trophy and award companies like K 2 Awards or Trophies2Go.com. They ship very quickly, even with the engraving. If you’d like to see larger images and a more detailed description of how I made this costume, please visit Julia Roberts Halloween Costume. 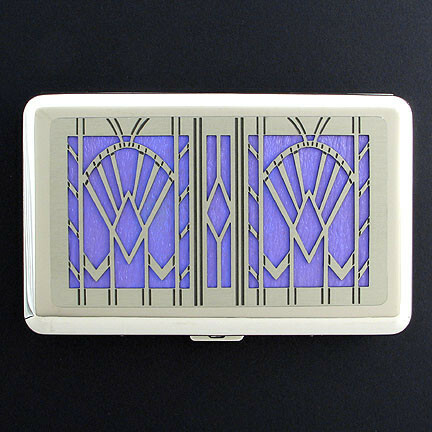 For unique gift ideas such as the engraved metal credit card wallets or travel pill cases shown above, check out our Achievement and Award Winner Gifts.